Did you know that 50% of shipping cart abandonment is due to high shipping rates? ELEX’s USPS Shipping Plugin offers you a lot of handy tools for effective WooCommerce USPS packing. Using them properly can save you from losing a lot of probable customers. WooCommerce USPS packing, mostly depends upon your business sphere and the type of product you sell. Perfectly packed shipments incur less USPS shipping charges. Going through the article you will gain an insight of the packing options available with USPS. And this will certainly let you choose the best combinations available. We’ll explore them in detail. USPS Shipping plugin with Print Label provides you all options available with USPS. The illustration below will take you to the options. First, the packing options. These decide how the items will be packed. We’ll see them in detail too. Second are the Rates. Here you choose whether you want to show all rates or just the cheapest one. Remember, in case you want to show flat/free shipping, you should disable Standard API services. Otherwise, live rates will appear along with Flat rate. How to use these options effectively? We’ll discuss a few scenarios for each packing option. For instance, we’ll use free shipping/flat rate while disabling API rates or to assign boxes and dimensions to fit our products. We’ll see more of such combinations as we move on. This option can be best for businesses dealing with Antiques & Art Works. Consider yourself selling ‘Antiques and Art Works’ online. Either you’ll have one piece or the customer will buy one piece of it. As a result, you can expect single item orders on regular basis. Your buyers are ready to pay higher prices for obvious reasons. So you may not want to annoy them with small shipping charges at the time of checkout. The first combination should be using Free Shipping option. One such customer orders a painting and a vintage table clock. For shipping these items from Boulder County, Colorado to LA will cost you $37.06 for Priority Mail and $107.37 for Priority Mail Express. What you can do is, adjust the prices of individual items to compensate the shipping expenses. 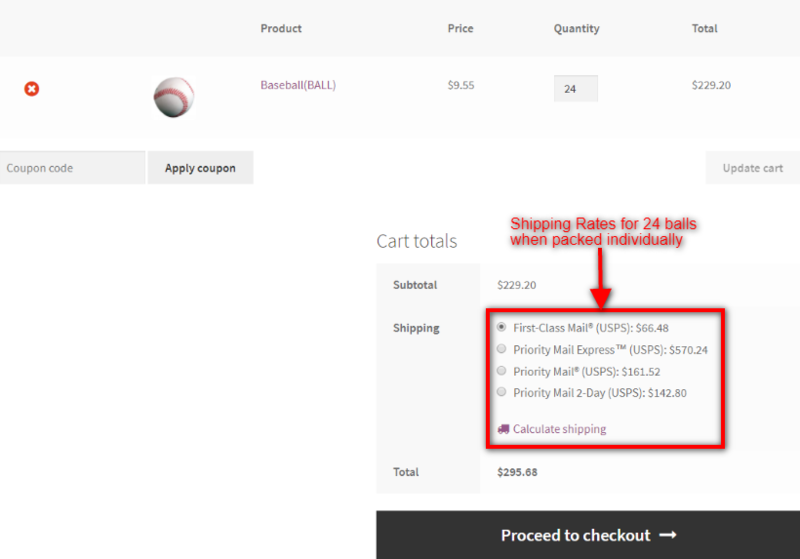 And you can display the free shipping tag in the cart and during checkout. Go to Shipping Tab and add a shipping zone. Give a zone name and set the eligible regions. Click ‘Add shipping method’, and select Free Shipping. To get only Free Shipping at checkout, you need to disable Standard API Services in the USPS Shipping plugin interface. 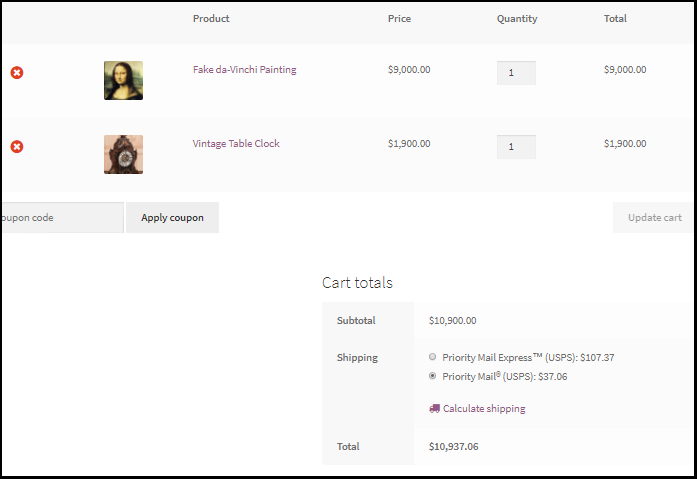 The price of the items can be set at Dashboard< Products followed by clicking on edit/quick edit to change the cost. Let’s suppose you deal with products like Sports Items, Merchandise, Game boards, Gifts, Packed items. In such a case, this option can prove to be the most economical one. So, a baseball academy in LA orders 24 standard size balls from your store located in Colorado, which is under Zone 5 in USPS shipping. You’ve each ball as one item on your store. The diameter of one ball is 2.89 in. 24 such balls can be packed in a box of dimensions 12 in x 9 in x 6 in. Here you can assign a box of that size. Choose “Pack into boxes with weight and dimension” to get this table. With this, the items are first packed in the boxes assigned by you. And if all the items don’t fit in the box you assign, the plugin chooses a different one for you. The algorithm selects the most efficient boxes automatically to offer the minimum shipping rates. Note: This works best when you select “get a quote for unpacked item by itself” for the unpacked items. In the above scenario, the plugin selected Regional Rate Box B1 to pack 24 balls by itself. This is because the assigned box B2 is not large enough to accommodate all the items. This information is available when the debug mode is enabled. Shipping Rate for 24 balls is $10.95 through Priority Mail. 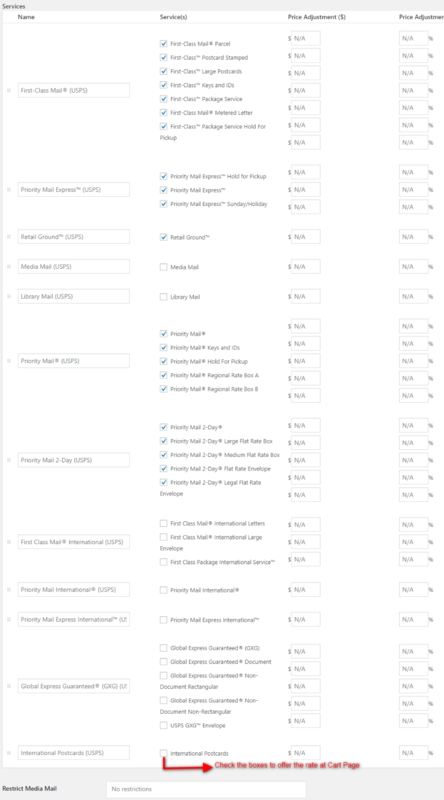 The shipping rates are abruptly higher when you select “pack item individually”. 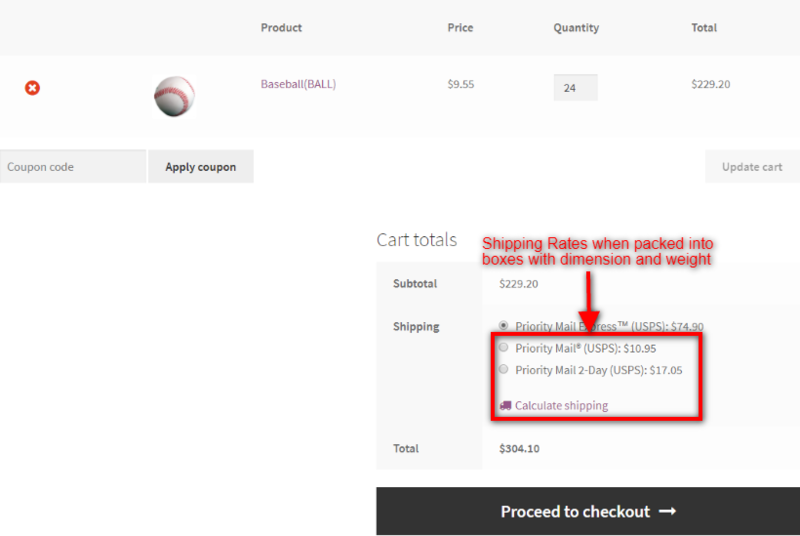 The shipping charge for 24 balls for the same zone would be $161.52 through Priority mail. Take a look. So using “Pack into boxes with weight and dimension” is certainly going to curb excessive shipping rates. 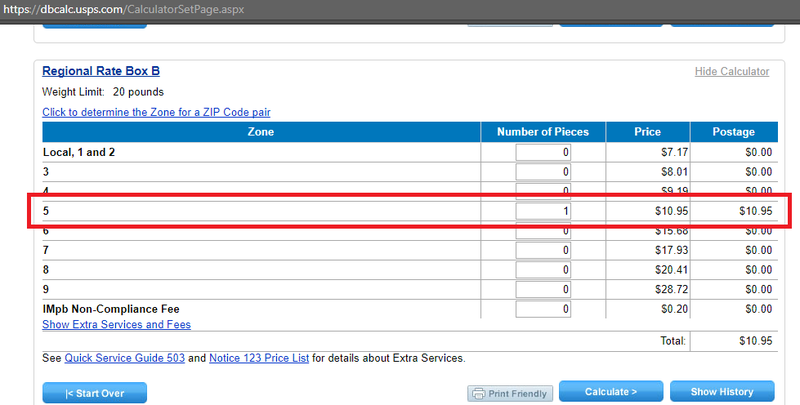 Checking through “USPS Shipping Rate Calculator” for zone 5, we see that, USPS ships the Regional Rate Box B for $10.95. You can check them here. This is best suited for stores selling Groceries, Packed Food Items, Different Branded items, etc in one shop. You receive an order for a household. The order contains 20 Cookie packets of 2 brands, 20 soft drinks of two brands and a pair of badminton rackets (dimension: 20x10x2). It would be just fine to ship edibles and racket in two different boxes. Clearly, you don’t want to ship the rackets packed in a box full of cookies and soft drinks. Dimensions of biscuits and soft drinks are less than 12 in (Set them in Products section). So rates for cookies and soft drink are quoted separately and the badminton rackets are quoted separately. The algorithm automatically selects the box with the least open packing space left. This ensures, your customers are paying for the cheapest possible USPS Shipping rates. Finally, two type of shipping rates gets added. Furthermore, as mentioned earlier, you can choose to show the cheapest rate only to your customer or all rates returned. Showing all rates returned, will surely impart a feeling of trust for your store. Rates are subject to changes by USPS. Find more options available here. You export cotton in bulk and think that dimensions are of no use to you. Then this is the packing option for you. Stores selling Raw materials, Industrial Supplies, etc., will get maximum benefits using this option. The improved Weight based Parcel packing option lets you enter the maximum weight per package. You can choose the Max Package Weight value. For instance, 20lb will divide the whole quantity, into packages containing 20lb each. For example, 65lb of the material is divided into 4 boxes of 20,20,20,5 lbs. “Pack heavier items first”, packs 10lb of item A, 10lb of item B and 8lb of item C in a manner that heavier item will be packed first. So here, the 10lb items are packed first followed by the 8lb item. “Pack lighter item first” will do the reverse of the previous option. It will pack 8lb item first followed by 10lb item. “Pack Purely divided by weight” does not follow any order, it completes the Max Package Weight value of 20 before moving to next box. We saw the interesting combinations possible with USPS packing options. All of these combinations help us get a reduced shipping charge. 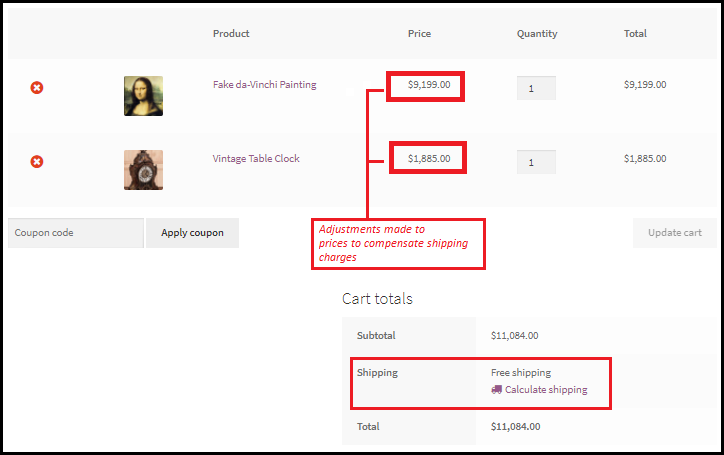 Thus by applying similar combinations, we can reduce cart abandonment due to higher shipping charges. With a hope that the article gives you an idea to choose packing options properly, I am signing off. To know more of the interesting features of the WooCommerce USPS Shipping Plugin with Print Label login here. And for any queries regarding the packing problems shoot your comments in the comment section below. Visit our product page for more Premium Plugins. Happy Selling!